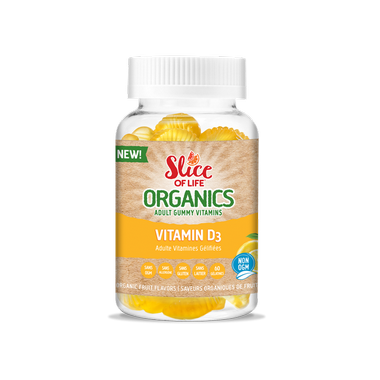 Pure and potent Vitamin D3 gummies for adults. Vitamin D3 is an essential key to immunity health and aids calcium absorption for healthy bones. Non-Medicinal Ingredients: Organic tapioca syrup, organic cane sugar, citric acid, pectin, sodium citrate, natural lemon flavour, organic colours (pumpkin, apple juice concentrates), organic sunflower oil and organic carnauba wax to prevent sticking.